Installation is possible at the same distance as Proximity Sensors with Resin Heads. 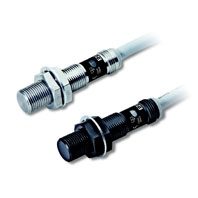 The metal heads of the E2EF achieve the same distances for the same sizes as the E2E Proximity Sensors with Resin Heads. This allows you to use Proximity Sensors that withstand friction with the workpiece without major changes to mounting brackets. More than 20 times*1 the durability of Proximity Sensors with Resin Heads. The 0.4-mm *2 metal head exhibits almost no wear due to friction with the workpiece or cleaning with metal brushes. This helps prevent equipment down time due to sensor failure and reduces the frequency of replacement. *1.Stainless-steel brush test with M12 model. *Test results for stainless-steel brush rotating at 130 rpm. Spatter-resistant models with fluororesin-coated head are also available.Reduces adhesion of spatter to achieve stable detection.The tough all-stainless steel housing with a flame-retardant cable enables reliable application where spatter is present near welding machines. The spatter countermeasures reduce the risk of malfunction due to the buildup of metal debris or spatter. Frequent cleaning with metal brushes is not required. Vinyl chloride is used for the cable material, and separate protection is required.